If you need to purchase new siding for your home, then chances are you have considered using real wood siding. After all, wood has been a natural choice for decades. Recently, though, the game has changed. There are now dozens of vinyl siding products available that are durable, beautiful, and easy to install. Maintenance: Any exterior wood on your home is going to take a beating from both the weather and the sun's exposure. That means annual maintenance may be necessary, if you want your siding to look great and last a long time. Choosing a siding product made from wood can require you to hire a contractor to refinish your home's siding every couple of years; or, if you are a die-hard DIY'er, then you may need to spend a few weekends atop a ladder with bucket and brush in hand. 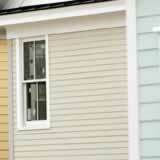 Your other option is to choose a style of vinyl siding that looks like wood and never needs refinishing. Installation cost: When pricing home improvements, time is money: The longer it takes a hired contractor to install new siding on your house, the more the project is likely to cost. If your new siding is made from real wood, then extra installation time may be required to cull out any warped or twisted boards, cut out any large knots or other defects, and completely seal all four faces of each siding board with a protective finish. Of course, a quicker option would be to choose a style of vinyl siding, because each siding panel is ready to install right out of the box. To get estimates from vinyl siding installation specialists in your area, fill out the form on this page. Aesthetics:One of wood's most appealing characteristics is the texture of its natural grain pattern, which can help spice up an otherwise bland wall of exterior siding. If this aesthetic appeals to you, then you should know that there are now many styles of vinyl siding that have textured surfaces that are made to simulate the look of rough-sawn wood boards, board and batten siding, and even log cabin siding. These styles of siding are also available in dozens of vibrant colors, which can give your home's exterior the unique look that you desire. If you are not familiar with the latest vinyl alternatives to wood siding, they are definitely worth exploring. In some cases, you'll spend less money on siding when you choose vinyl rather than wood, and you may even find that the installation job gets done sooner. Engineered wood: comparable to vinyl siding cost?